Very often you encounter this absurd logic at the dentist office: Dental x-rays are compared to background radiation. 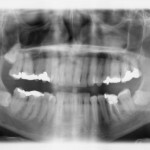 They will tell you a “typical” x-ray of your teeth is about as much as a day outside from background radiation. However, background radiation comes from very many different sources. It comes from various sources, from various directions at the same time, with varying intensity, and most importantly spread out over the course of the day. It’s spread out over 24 hours, coming from random directions with random intensities. I park my car outside and it rained for 24 hours. 24 Hours = 24 * 60 mins/hour * 60 seconds/minute => 86,400 seconds in day. Today it rained a total of whopping 2 inches (5 cm) because there was a thunderstorm followed by light rain and the rain came more or less from all directions. The surface of my car is say, 10 square meters, it was hence hit by 0.05 meters * 10 m^2 => 0.5 cubic meters of water, which is a whopping 500 kg of water. That’s half a metric ton of water! Now let’s finally apply the logic of a dentist: Let’s take half a ton of water and dump it on my car in just 0.125 seconds (the time the x-ray is radiating your head area), and let’s also make sure it comes down not to the entire roof, but just a few square centimeters. Unlike background radiation, the dental x-ray comes with laser-like concentrated focus and strength and only lasts 0.125 seconds. It also hits a very small surface area of your body. Hence it is 86400 / 0.125 => 691,200 times stronger than background radiation, but only for the duration of 0.125 seconds. This calculation does not take yet into account that background radiation hits your entire body, not just 1/100 of your body. Hence, the x-ray is more like 7,000,000 stronger than background radiation, again only for 0.125 seconds and only to a small area of a few square centimeters. Whether this is safe or not, I’m not discussing or implying here. It’s the logic I have a problem with.. What does safe mean anyways, especially to a dentist? What solid proof is out there that these x-rays do not cause cancer 20-30 years later? And if they did cause cancer to you, do you think anyone would listen, consider it as a possibility, or even apologize? That I can answer with some certainty: No. Just because there is no proof that x-rays cause cancer, it doesn’t mean they don’t. Today it just means no one wants to spend a lot of money on expensive research studies to find out. Also it would be unethical to experiment with radiation; hence, they only use observations. And there are good reasons not to find out whether these x-rays are dangerous if you consider how much is being x-rayed for no reason these days, no reason other than to make money and to practice “defensive medicine” that is only concerned with profiting and protecting the dentist legally at the cost of your health and pocket. Sure you will want an x-ray done if you have an abscess, but there is no medical reason to x-ray just to clean your teeth or fix a small little filling. If you think I messed up the numbers, please feel free to comment below. You may also want to check out the list of scientific studies linking x-rays to tumors and how to find a dentist who works without x-rays. Spray Foam Risks, Dangers, Odor, Smell: Is this Insulation Toxic?